The Queen Elizabeth Olympic Park was not yet opened officially, but the Join In Trust and Team London put on Go Local, an afternoon show on the big stage for over 30,000 people to celebrate volunteering in general and show appreciation for London 2012 volunteers in particular. We shared the stage with illustrious acts such as McFly, Eddie Izzard, The Feeling, and our friends from the Games Maker Choir. 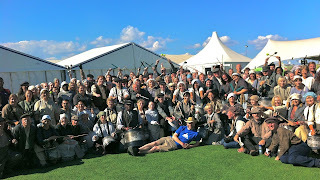 After a 60 second countdown, over 100 of our drummers, 36 Working Men and Women, and 3 Brunels opened the main show with a reprise of Pandemonium, the segment of the London 2012 Olympic Opening Ceremony that saw a Green and Pleasant Land transformed into an industrial landscape, ending with the five Olympic Rings being forged during the show. As soon as five solo drummers stepped out onto the 30 metre wide stage, which was previously used for the big acts at the Hard Rock Calling and Wireless festivals, the 30,000-strong crowd burst into cheers. 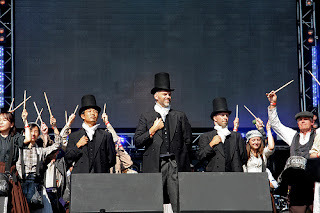 The solo drummers were followed by the entrance of over 100 drummers in their original Industrial Revolution costume, which was the moment when many London 2012 volunteers in the audience reportedly burst into tears. Halfway through the 5'30" performance, the drummers opened up a gap in the middle through which 36 Warriors and Working Men and Women emerged - they were the people who ripped up the turf in the Olympic Stadium one year ago. During a musical break, three Brunel actors appeared from the corners and the back of the stage to meet in the centre and metaphorically 'teach' the workers their movements, and throughout the show, stills, videos and even a live video feed were shown on seven giant screens. As the workers disappeared, the drummers charged forward dramatically for the powerful finale, which again was greeted with a huge cheer from the massive crowd, before all volunteer drummers and actors made way for the show to unfold. This was our first show of this size that was fully run by ourselves as volunteers, including the overall show design, the choreography, the rehearsals, the recruitment and management of volunteer performers, and everything else, and thus marks an amazing achievement in the eleven-month history of our existence as a volunteer drumming group. We were generously supported by the producers of the show, Eleven 11 Events, who booked a notable person to help us with the final staging: Kim Gavin, Artistic Director of the London 2012 Olympic and Paralympic Closing Ceremonies, with whom we worked as Athlete Marshals at the Olympic Closing Ceremony! We even recruited our own small team of three Games Makers, who helped us with participant organisation and staging. The whole team was flexible enough to cope with last-minute changes to the stage setting, requiring major adjustments to the planned performance, and we ultimately had to draw on our second backup plan, which still delivered a neat show. The performers were facing a few additional challenges, yet managed to pull of a performance that left everyone with big smiles on their faces. The excitement of performing on the big stage in front of over 30,000 people was tangible throughout the event and transferred easily to the audience. Directly after the performance, Games Maker Choir members greeted us enthusiastically backstage, and we were amazed by the responses from the crowd and via social media channels. Organisers Join In even nominated us as the audience's favourite act! A few audience members managed to capture our performance, such as Kath McGuigan. And our photographer Vilma took a number of impressive photos. 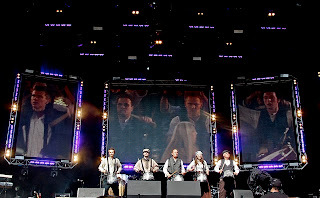 The Pandemonium Drummers were originally put together by London 2012 Ceremonies for the Pandemonium segment of Danny Boyle's spectacular Olympic Opening Ceremony. Following the Ceremony, the volunteer drummers kept on performing at a variety of events. Based on their extensive training, they performed at other Opening Ceremonies, including the UEFA Champions League Final 2013, the FA Cup Final 2014, and the Heineken Cup Final 2014, and at a variety of large and small festivals as well as sports and community events. 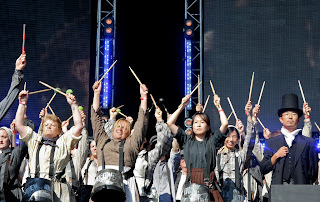 The Pandemonium Drummers are a returning act in London's major parades, including the London New Years' Day Parade, St Patrick's Day Parade, and the Lord Mayor's Show, and they coined Cheer Drumming, supporting runners at major sports events across the capital and beyond. 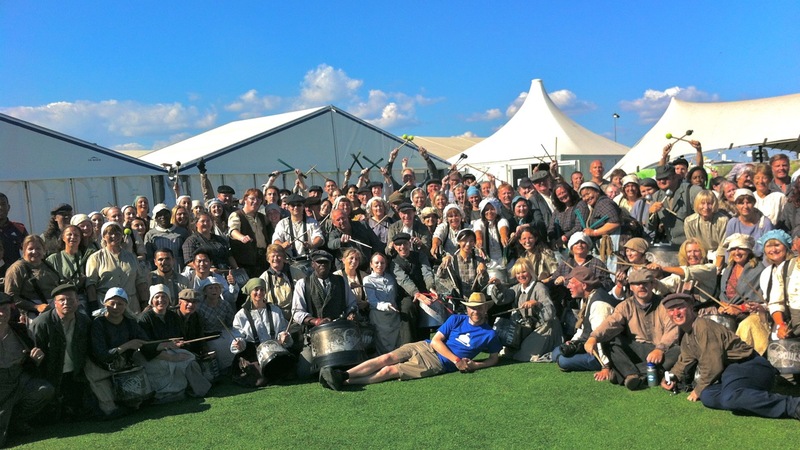 The Pandemonium Drummers have supported the Special Olympics, the Teenage Cancer Trust, and a wide range of other charities. The Pandemonium Drummers are a constituted association with charitable aims, and are working on a non-profit basis as volunteers. Comments may be moderated before appearing on the page. 5 Years of Pandemonium Drummers!